The holidays are upon us and another year has come and gone. As we wave good-bye to 2016 and prepare to welcome in a new year, I stopped to reflect on the year gone by. What an emotional year! (No pun intended) The world saw a lot of turmoil in 2016 and generated a lot of reactions. Some of the headlines brought Sadness and tears, others Surprise followed by shock and dismay and finally we saw headlines and events that unearthed Anger and rage. It was a great year to have The BitterSweet Score as a tool to track my own reactions to the world. In full disclosure, I was in denial about what my scores revealed. My tests showed, regardless of the scenario, the emotion of Anger. Yes, Anger... I am not saying I didn’t have other emotional responses, but I kept finding Anger popping up repeatedly in situations I would never label Angry. This really surprised me. Anger in some situations made sense. In others, not so much. Can you say Mind Blown? I for one have no desire to let Anger continue to be this underlying thread in my emotional life. As we note in our book, The BitterSweet Score – Flavors Defined, the power of Anger, like the power of all the emotions can be harnessed to deliver superior outcomes once you have clarified the situation and identified the emotion driving it. In ruminating over my recent discovery, I have decided Anger is not how I want to react to the world and have thus made my only resolution for 2017: LOVE MORE! Instead of focusing on the Bitter, I must refocus my emotions where I want them to be, in the Sweet zone. As I continue to use The BitterSweet Score Tool, I will catch my emotions and have the power to change them. Here are three strategies I plan to practice in 2017 to shift my responses from being driven by Bitter emotions to allowing my Sweet emotions to dominate. 1. Take a minute to determine if the situation is being driven by emotions or just part of the day. 2. If emotions are driving a reaction, I must pause and take an Emotional Inventory. a. Do I know what I am feeling for sure? b. Is this Bitter or Sweet? c. If unsure, can I form a “Feeling Question” and use The Bittersweet Score Tool to isolate my dominant emotion? 3. Do I react now or defer my response? a. How can I use the power of the emotions I am feeling to better the situation? By using the three strategies above, I will be more diligent in my pursuit of emotional identification and understanding in 2017. You should try them as well. Armed with a better understanding of our dominant emotions, we will be able to harness their power to enhance any situation. What did your BitterSweet Score reveal about you in 2016? What emotion(s) do you need to focus on in the New Year? 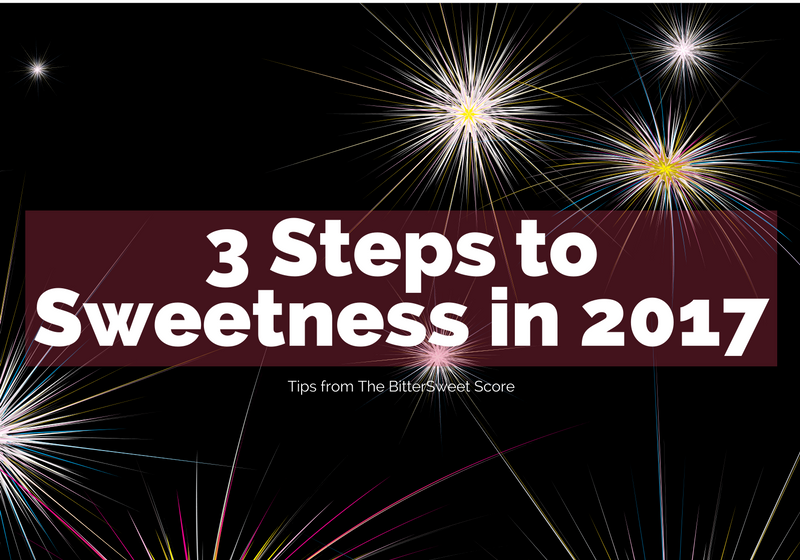 How can you use The BitterSweet Score in your life? What else could The BitterSweet Score provide to help you? Do you have a question about emotions you would like us to answer? If so, just pop it into the comments section and we will be sure to respond!